Aluminum parts finishing meanings that we need to have aluminum parts with finishing process, we offers more finishing process for aluminum parts like anodizing, brush, sanding, black oxide and coating Telfon etc. Of course, aluminum parts finishing process we need to further consider the aluminum parts machining process, whether it is CNC milling, CNC turning, die-casting, or extrusion etc. if so, the parts surface finishing will be completely different. This process aluminum is almost similar to cnc machining, we also provide it with anodizing, usually, we have 2nd process for extrusion aluminum materials, most of extrusion aluminum materials we have anodizing natural colors. Sand blast process is to use compression air to have abrasive spray on aluminum products to have fine texture on the aluminum products surface finishing. 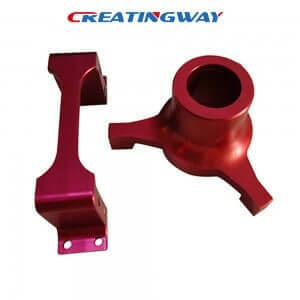 It is one special machining process for aluminum materials, usually, we need to have 2nd process for die-casting aluminum parts, then finishing it, like painting, Because of almost most of die-casting parts can’t be anodizing, and it is very easy to shucking, so as usual, we have painting process for them. In Creatingway, our engineer team always closed to work with you together, in order to offers more our suggestions and machining process to easy your design and products, so you can get reasonable solutions under competitive prices , easy process and delivery on time, make your projects so easy. I’ve heard a lot about die casting, but I’ve never known exactly what it was. I think it’s cool that they use finish on aluminum parts to make them more durable. Plus they can use a method like sand blasting to finish it! Thanks for the information. Yes, we have own these process, and would you please help send out your comments to my email, so we can work out more details to you.